San Diego State redshirt-junior forward Matt Shrigley couldn’t buy a basket in his first six games since coming off an ACL tear in the offseason, missing his first 14 shots, 13 of them behind the arc. 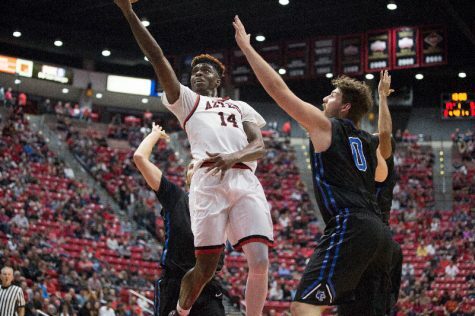 But Saturday night against Air Force Academy, he took the monkey squarely off his back with 12 points to help lead the SDSU men’s basketball team to a 70-61 win. 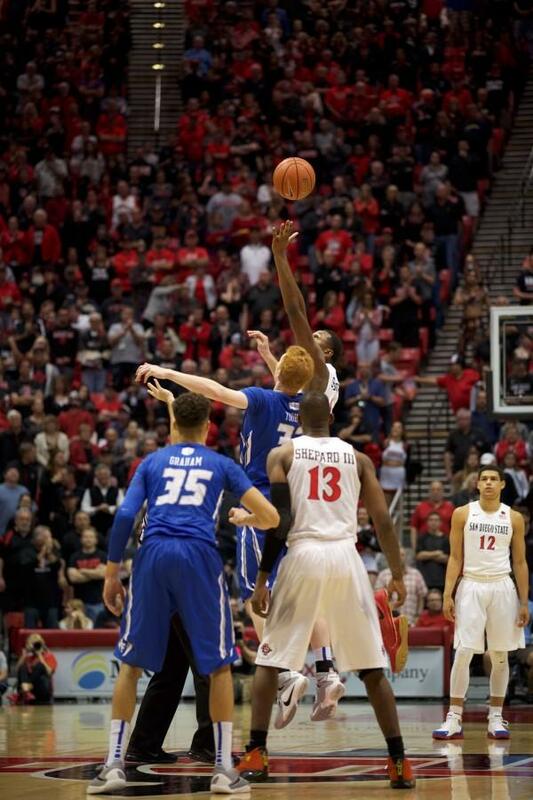 “He needs to see the ball go through the net in a game, and hopefully that’ll happen before I retire,” head coach Steve Fisher jokingly said Friday of Shrigley. Well, Fisher got his wish, and then some, as Shrigley drained the first four shots he took, all 3-pointers, in a span of less than three minutes midway through the first half. “He made some timely ones early and I think that helped other guys make 3’s,” Fisher said. That would be the extent of his point production, although he was still the team’s third-highest scorer. 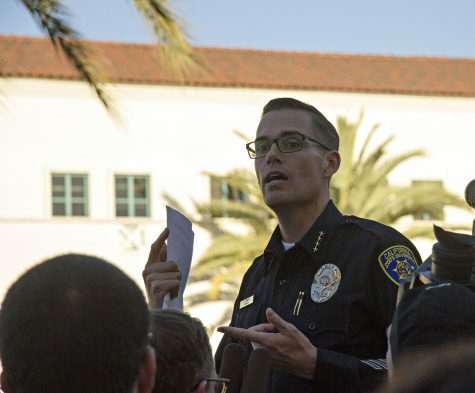 Barring Golden State Warriors guard Stephen Curry, most 3-point shooters are streaky in nature, but even Shrigley said he’s never been in a slump like the one he was in to begin this season, at least at SDSU. Seeing the first one go in was just something he had to just see to believe, because as he said after the game, he thought his 14 previous shots were all going in. “I didn’t think I’d have this weight on my shoulders coming back but it’s definitely nice to knock a few down,” Shrigley said. As Fisher predicted in prior press conferences, the crowd gave Shrigley a standing ovation after he made his first one, and then began chanting his name after the fourth. “Our fans did a wonderful job expressing their appreciation for what he did,” Fisher said. Also in the boat of looking to right some early-season wrongs was sophomore forward Malik Pope, who had a team-high eight rebounds and also added 13 points on 3-of-5 shooting from from beyond the arc. 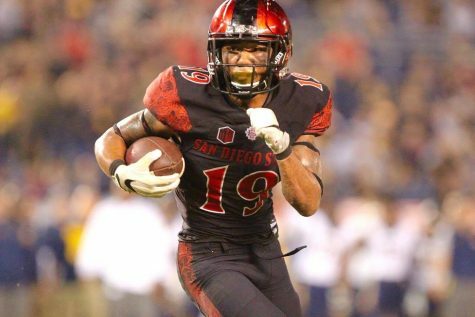 Besides the feel-good story, without Shrigley’s contribution the Aztecs may have been saddled with consecutive losses, something about as rare as seeing the Loch Ness Monster around the Mesa. The team was without leading scorer, freshman point guard Jeremy Hemsley, who sat out the entire game with a bone bruise on his right foot. 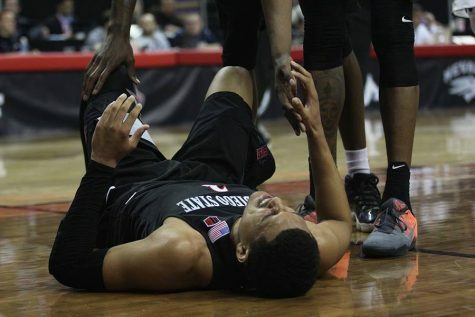 Hesmley’s foot was stepped on during the Fresno State game and Fisher said he was “shocked” when Hemsley told him he didn’t think he could start, but may have been available in an emergency situation. 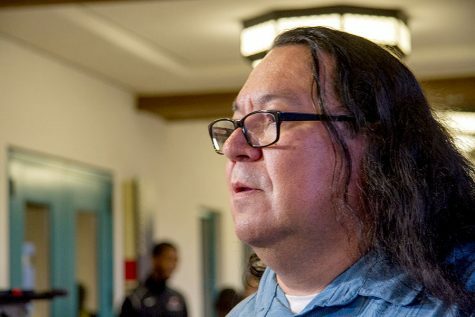 “I’m glad we didn’t get tempted to try and put him in,” Fisher said. Shrigley also led the team with six assists, his first six of the season, something that Fisher said was equally, or more, important than his 12 points. 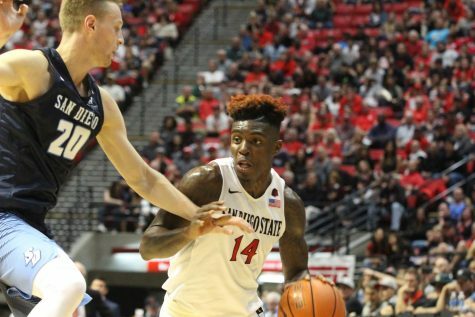 While the team’s 30.8-percent mark from behind the 3-point line was nothing to write home about, the Aztecs made a huge improvement on what Fisher said was the biggest reason for the loss at Fresno State: turnovers. 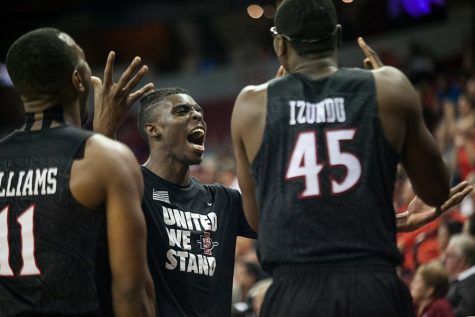 The team had 13 less turnovers than its streak-breaking loss against the Bulldogs. “They knew it, they knew (turnovers) cost us last game,” Fisher said. 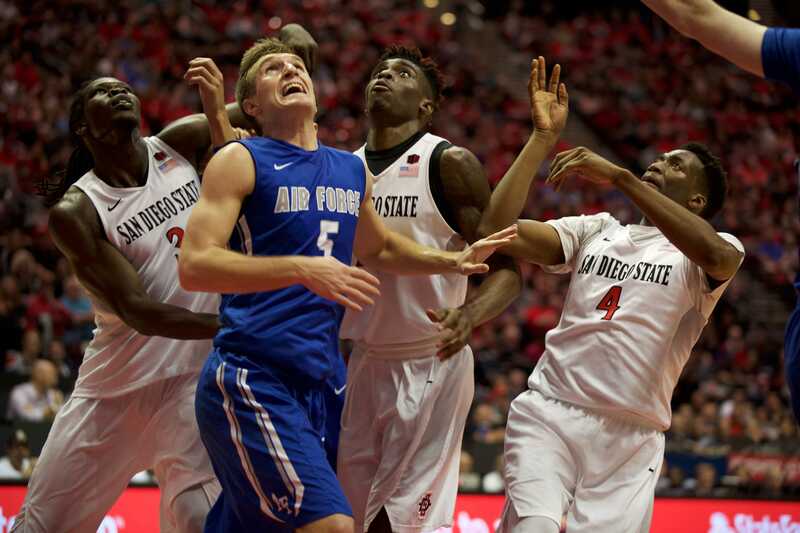 Without a starter over 6-foot-7, Air Force employed a compact 3-2 zone to get as many bodies inside the paint as possible. This made the 3-point line vacant territory on many occasions, but the Aztecs were not able to capitalize most of their possessions, outside of Pope and Shrigley and sophomore guard Trey Kell toward the end of the game. “They dared us, then double-dared us to shoot the ball from the perimeter,” Fisher said. Fisher said he “hopes” teams zone the Aztecs down the stretch, but also thought that 39 3-point attempts was more than he’d like. 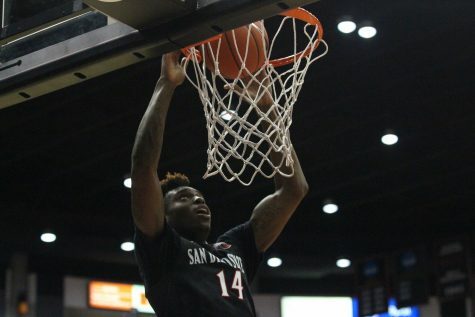 With the height advantage, though, the Aztecs dominated the offensive glass, which has been an issue in many of the team’s games this year, with 13 offensive boards compared to three for the Falcons. That led to a 12-2 advantage on second-chance points as well. 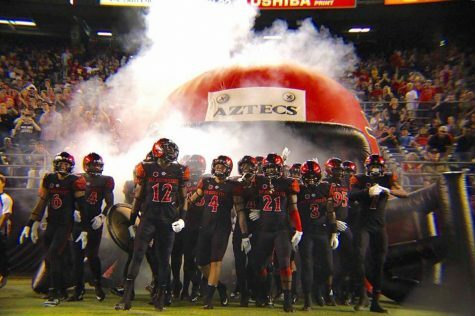 The Aztecs will now get a week’s rest as their next matchup will come 1 p.m. next Sunday at San Jose State University.